A 5-2 loss in Game 1 of their first-round series against the San Jose Sharks served as a wake-up call for the Vegas Golden Knights: They aren’t the only team that has upgraded its roster. They can’t stand pat and pray that a similar effort produces a different result on Friday night. Barring a meltdown from Martin Jones in net, it probably won’t. With Brent Burns, Erik Karlsson, Logan Couture, Tomas Hertl, Joe Pavelski, Timo Meier and Evander Kane at its disposal, San Jose holds the edge in pure skill. 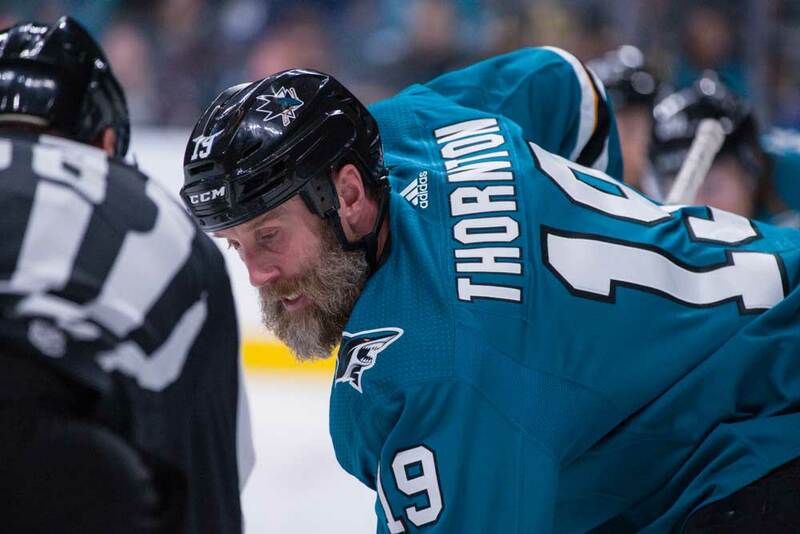 Even 39-year-old playmaker Joe Thornton looks rejuvenated and threatening now that he’s finally healthy. Of course, Vegas has added Mark Stone, Paul Stastny and Max Pacioretty since its last playoff appearance. Rumor has it KHL star Nikita Gusev’s arrival is imminent as well, but his contract may cause some issues. If he does join the Golden Knights, there’s also no telling how he’ll adjust to a small ice surface that feels even smaller in the postseason. Overall, Gerard Gallant’s men are outgunned. San Jose doesn’t require as many opportunities to make you pay, and we saw that exact scenario unfold in the series opener. Vegas controlled 63.2% of the high-danger chances and posted a 57.5% expected goal share at even strength, but the Sharks capitalized on their looks and prevailed due to a three-goal flurry in the second period. Game-breaking talent has a way of defying the balance of play. As such, the Golden Knights can’t merely regroup. They need to rewind the tape all the way back to last season, when a scrappier cast of players smothered opponents into submission through sheer force of will. Above all else, it was the team’s forecheck that wreaked havoc and propelled the Cinderella squad to the Stanley Cup Final. That pressure at the point of attack has largely been absent this year. Frankly, the introduction of three top-six forwards was always going to raise that concern. Vegas has a brand new second line and Stone (73 points in 77 games) instantly became the team’s best player when he was acquired at the trade deadline. Given that a lack of high-end forwards ultimately held them back in 2017-18, the reinforcements up front — in addition to the long grind of another regular season — may have diluted that urgency to outwork their counterparts. They’re going to need to summon it against the Sharks, though. San Jose is just as good as Vegas in terms of puck possession, but it’s considerably more potent. Though both clubs controlled about 55% of the shot attempts and chances at 5-on-5 during the regular season, Peter DeBoer’s men converted on 9.0% of their bids compared to Vegas’ 7.7%. The story was no different in the high-danger areas, where San Jose finished seventh (18.8%) compared to the Golden Knights at 24th (16.0%). The Sharks are just a really dangerous club from front to back. Pavelski and Meier are terrific in tight, Kane can score from virtually anywhere, and Couture, Hertl and Thornton can generate opportunities on the rush as well as the cycle. Oh…and then there are the two trump cards: San Jose boasts the most dynamic pair of defensemen in the world. Burns and Karlsson do commit their share of head-scratching blunders — that’s bound to happen when you own the puck that often and look to make things happen — but their ability to create space, filter shots through traffic and generally bewilder the opposition is unbelievable. Among blueliners with at least 500 even-strength minutes played this season, they ranked top five in shot attempts, shots and rebounds created per 60 minutes. That type of dual support from the back end has altered the fabric of the entire offense. Attempting to defend against the Sharks’ forwards by themselves is already challenging enough. Adding a layer of constant activity and world-class skill behind them leaves most defenses feeling utterly helpless. In Game 1, Vegas attempted to mitigate San Jose’s weapons with aggression. It threw 41 hits and held its own physically against a big team, but that isn’t the key to beating the Sharks. They just rolled with the punches and sprung to action following the contact, which gave them the leg up on the Golden Knights throughout the night. Last season, Vegas didn’t win because it was running anyone through the boards. It stayed right on the opposition’s hip and won pucks back with active sticks and furious hustle. When you played against that team, there was absolutely no time or space. The forecheck was relentless and the positional support was airtight. It was wave after wave after wave. They covered every inch of the ice. The current Golden Knights lay off the gas far more than they should. They aren’t a lazy club by any stretch, but at the moment, opponents have an extra split second to assess the situation. That undoes so much of what made them a legitimate contender in 2017-18. That let-up is perhaps most evident with the first line. William Karlsson (56 points in 82 games), Jonathan Marchessault (59 points in 82 games) and Reilly Smith (53 points in 74 games) terrorized opponents last season with their blend of pace, motor and craftiness. They were seemingly everywhere all at once and kept storming the gates until they buckled. Now entrenched as staples rather than cast-offs, their hunger no longer defines them. While they still generate their share of chances (54.8 SCF%, 53.3 HDCF%), their tidal waves of momentum have simmered down and stranded their finishing touch. As a result, their GF60 has dipped from 3.98 to 2.85. Beyond their own unit, Karlsson, Marchessault and Smith were the catalysts for the team’s magical run a season ago. They led the charge…but that charge isn’t as fervent and undeniable this year. Once fueled by a single-minded drive, the club appears disjointed and hesitant. It’s the newcomer, Stone, who now embodies Vegas’ former philosophy. In addition to scoring his team’s two only goals, the world-class winger was all over the ice on Wednesday, continually hounding the puck and harassing the Sharks. If Vegas can’t pull it together in Game 2, Gallant should consider mixing up his lines and handing Stone even more minutes to spread his influence as far and wide as possible. They say, “Hard work beats talent when talent fails to work hard.” That’s only partly true. Bona fide stars can mask otherwise fatal flaws. In Vegas’ case, however, it only boasts one elite player: Stone. Fighting fire with fire against the Sharks is therefore ill-advised. Instead, they should be trying to smother the flames. Don’t give that fire any room to breathe. That may sound like a tall order, but the Golden Knights accomplished just that only one year ago and consequently went four rounds deep. In order to advance past the conference quarterfinals this season, they may need to look back first.